RUSH: Predictably the long knives are coming out for Newt Gingrich now. Here’s a story. This is Jonathan Martin, Politico. “As Newt Gingrich Surges, Rivals Raise Questions About His Temperament.” Oh, yeah, and then in the Washington Examiner (ostensibly a conservative publication) there’s a columnist. I don’t have it in front of me, so I don’t know the name of the guy, the writer, but he says Newt’s no conservative. You conservatives better wake up. This guy at the Washington Examiner says Newt’s no conservative. Newt is an inside Washington guy who will side with big government interests every chance he gets. Look at all the so-called Newt gaffes, this guy points out, like Pelosi and the carbon credits, so forth. His instinct is to go with the big government option every time until he gets slapped down by conservatives. So whenever anybody in the Republican field jettisons to the top, here come the hit pieces. The “temperament” thing is never gonna stop. The temperament thing… (interruption) Goldwater, Nixon, Reagan? Well, they never got on Reagan about his temperament. (interruption) Eh, that’s not temperament, though. When they say, “He’s nuts and might push the button,” that’s he was a wacko. McCain’s temperament was that he had a temper, and he does. Dole’s temperament? I don’t know what Dole’s temperament problem was. Dan Rather yesterday was on MSNBC. Remember I was shocked to see Dan Rather alive? He was on MSNBC. 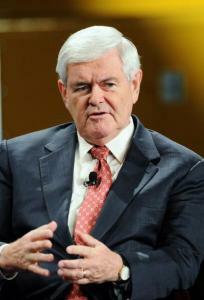 He said, “Newt, when you start talking politics, is like a wounded wolverine. You’ve gotta be prepared out there.” So they said they can’t say, like they’re trying to say about Herman Cain, that Newt is stupid. They’re trying to say that about Herman Cain. “Herman Cain’s an idiot!” That’s what this latest stuff is about. They can’t say that about Newt, obviously. What they’re trying to say is that he’s nasty, he’s unstable, he’s unpredictable. Here’s just a taste of it. “With Newt Gingrich emerging as serious contender, some Republicans are questioning his fitness for a general election campaign by seizing on comments the former speaker made in 2007 about Hispanics. “This adviser, who shared the video,” with Politico, “also noted with some awe that the former speaker himself had last month blamed ‘Republican incompetence’ for losing Latino votes. ‘This video could be devastating to GOP efforts to court Hispanics if he were the nominee,’ said the” anonymous adviser and source for Politico. “Asked what Gingrich’s ‘ghetto’ comments say about his discipline, a Gingrich spokesman suggested the candidate’s performance so far in this campaign answered the question. ‘The final merits of whether a candidate is capable of leading the country will be decided beginning in Iowa and going through Tampa,’ said Gingrich spokesman R.C. Hammond. Now, there are apparently lots of people who are righteously offended at that — profoundly, instinctively offended — and they think that this is “unacceptable.” It’s insulting. It is as bad as anything anybody could say, period. Now, how has this happened? What was the example that happened late last week I was trying to analogize all of this to? Somebody made a perfectly innocent statement that just… Oh, it’s the sexual harassment stuff. The woman said in the original report on Herman Cain that there was “nothing overtly sexual” about the gesture, and yet all the guys on the left thought that this was no doubt slam-dunk sexual harassment. Remember after Hurricane Katrina, the Ninth Ward devastated, and there were liberals who wanted to rebuild it as it was. I was stunned. They wanted to rebuild it as it was because it had all this cultural tradition and history. It was a ghetto. It was a poor neighborhood, but for some reason it had some cultural attachment to the left. A lot of great art came out of there, in their minds, and a lot of great music came out of there. I’m sorry, I’m not quite conveying — I need to think of that one thing that I could analogize and I’m having trouble remembering from last week. Jonathan Martin was just outraged over something, and for the life of me I couldn’t understand what in the world there was to be outraged over. And normally these things that everybody gets so excited over are just straight up and down, right down the middle conservative thought. Nothing extreme, nothing odd about it at all. What Newt is saying here is that he wants kids to be taught things that will help them become the best they can be. The language of prosperity. What is wrong about that? And what is it that makes that exclusively conservative? Why is that not universal? Why is that something that the left doesn’t want? Why is this so outrageous? Why is the idea of prosperity for everybody, including Hispanic kids, why is that so outrageous? Why does that require an apology? What is it that Newt Gingrich said that has everybody scuttling around here, “Oh, no, that’s gonna ruin his presidential chances. See, that shows right there that this guy doesn’t have the proper temperament.” What? “Mr. Limbaugh, it’s not that he said the language of prosperity, it’s that he followed up by saying the language of living in a ghetto.” Well, that makes total sense to us. I know what he means by that, and it’s not the language of prosperity. We don’t think that in America people should be shut off from the American dream. We don’t think people ought to be shut off from the opportunity of prosperity. And we think that there are some obstacles that have been put in the way of prosperity and people achieving it. Newt is simply saying get those out of the way. And for this he’s got to apologize as if some major breach of comportment, deportment, civility, what have you, has taken place here. The ultimate impact of this is to shut everybody up. Everybody is afraid to say what’s obvious. Everybody is afraid to express a point of view for fear that somebody is gonna launch at ’em, make ’em apologize, humiliate them or what have you. And that bothers me greatly about this. RUSH: You know what it really boils down to is that the left wants the poor to remain poor. They want the language of the ghetto to remain the prominent language of people who live there. They want the underclass to remain the underclass. In fact, they not only want it, they need the underclass to stay the underclass. And anybody who comes along with any attempt to inspire or motivate people to escape those circumstances is gonna be forced to apologize for making some outrageously offensive statement.